For labels that cover all your business needs, stick with Laser Label sheets. Made from 50# premium stock and no-ooze permanent adhesive, they’re available in Bright White (91% Brightness), White Semi-Gloss, or a mix of bold fluorescents. They print smudge-free on most laser printers, and have easy-peel edges to make creating professional labels a snap. Choose from 15 popular configurations on 81/2 x 11 sheets, or customized styles available on request. More Uses. More Benefits. More Branding. Ideal for mailings, invitations, announcements, branding, packaging and more. 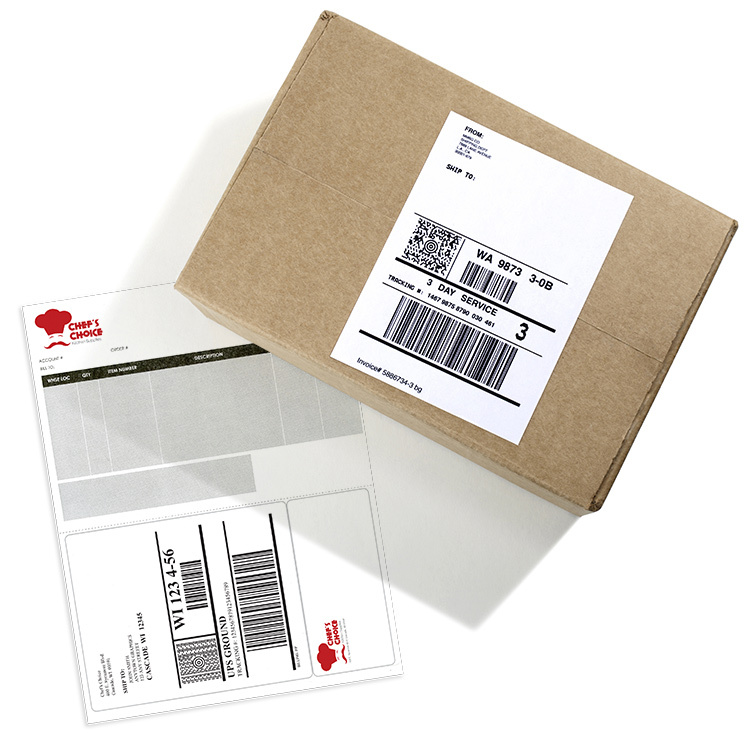 The Semi-Gloss Cover Up label provides complete coverage so you can reuse boxes, packages, mailing tubes, envelopes, etc. Easy to customize and enhance with barcodes, QR codes, logos, etc. Eliminates need to write out individual labels; also speeds up labeling for mailings and shipping. Available with free downloadable templates on our website. Packaged 100 sheets per box/10 boxes per carton. NOTE: Prices are per 100 sheets for indicated quantities. Premium Bright White or Semi-Gloss utilizing a permanent adhesive. These sheets are designed for trouble free use in most high resolution laser printers, copiers and digital presses. Enviro-wrapped in packs of 250 within each carton. Sold in full carton quantities only. NOTE: Prices are per 1000 sheets for indicated carton quantities. Bright White or White Semi-Gloss, Laser Finish, Flat Sheet and Pre-Die Cut Labels. What eliminates printer cleanup, causes fewer printer jams, costs less and makes you more productive? Integrated labels with a full-width liner. Integrated labels with a full width liner are more efficient and effective than patch integrated forms. Patch forms have a loose corner on the liner that gets caught in printers, as well as an unequal thickness that causes roller wear and feeding issues. Patch forms also leave a void that droops with gravity, and are made with non-printable liners. Priced per 1,000 sheets. Integrated labels feature both a form and a label in one sheet, creating an easier and more productive workflow. The full-width liner allows for easy, jam-free printing on most inkjet and laser machines. Poly-bagged within carton. Sold in full carton quantities only. We also offer integrated label forms in a variety of custom configurations.